(without stand or speakers) 63.0" x 38.0" x 7.3"
The BeoVision 4 television is at the heart of Bang & Olufsen's plasma home cinema solution, and is designed with a high degree of modularity. The plasma screen is separated from the BeoSystem master unit, which provides all connections for antenna, BeoLab loudspeakers and auxiliary units. The master unit is placed in an elegant aluminium-fronted floor cabinet, and it is a simple matter to integrate a BeoVision 4 home cinema solution to the rest of the home's entertainment with BeoLink, with everything controlled by the Beo4 remote control. 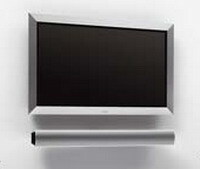 Placement options for the BeoVision 4 plasma screen offer great versatility. A range of wall brackets and table stands are available, and the aluminium finish of the frame around the BeoVision 4 plasma screen blends in easily and elegantly with any home decor and loudspeakers from the BeoLab range. Bang & Olufsen's skills with the anodising process mean we are able to offer frames in silver, dark grey, red, blue or black.